A depiction of the first teaching of the Buddha from a Vietnamese Buddhist monastery in Quebec, Canada. The Dhammacakkappavattana Sutta (Pali; Sanskrit: Dharmacakrapravartana Sūtra; English: The Setting in Motion of the Wheel of the Dharma Sutra or Promulgation of the Law Sutra) is a Buddhist text that is considered to be a record of the first teaching given by Gautama Buddha after he attained enlightenment. According to tradition, the Buddha gave this teaching in Sarnath, India, to the "five ascetics", his former companions with whom he had spent six years practicing austerities. The main topic of this sutra is the Four Noble Truths, which are the central teachings of Buddhism that provide a unifying theme, or conceptual framework, for all of Buddhist thought. This sutra also introduces the Buddhist concepts of the Middle Way, impermanence, and dependent origination. The Dhammacakkappavattana Sutta is said to be the first teaching given by the Buddha after he attained enlightenment. It is taught that the Buddha attained enlightenment while sitting under the Bodhi Tree by the Nerañjarā river in Bodh Gaya, and afterwards, he remained silent for forty-nine days. The Buddha then journeyed from Bodhgaya to Sarnath, a small town near the sacred city of Varanasi in central India. There he met his five former companions, the ascetics with whom he had shared six years of hardship. His former companions were at first suspicious of the Buddha, thinking he had given up his search for the truth when he renounced their ascetic ways. But upon seeing the radiance of the Buddha, they requested him to teach what he had learned. Thereupon the Buddha gave the teaching that was later recorded as the Dhammacakkappavattana Sutta, which introduces the fundamental concepts of Buddhist thought, such as the Middle Way and the Four Noble Truths. 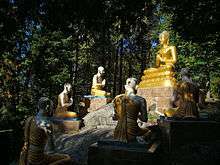 The Buddha addressed his first teaching, or discourse, to his five former companions, who are commonly referred to as the five ascetics. In this discourse, the Buddha addresses the ascetics as bhikkhus, a term which is normally translated as a Buddhist monk. However, Ajahn Sucitto explains that in this context bhikkhus means “alms-mendicants,” those who live on the free-will offerings of others. The five bhikkhus at Deer Park were named Kondañña, Vappa, Bhaddiya, Mahanāma, and Assaji. Kondañña was the eldest. Many years previously, as a novice brahmin, he had been invited to the palace of the raja Suddhodana along with seven of his peers to see the baby Siddhattha Gotama [the future Buddha] and give predictions as to his destiny. They all agreed that this baby would be either a great emperor or a Buddha; perhaps this was why he was named Siddhattha, which means “Accomplishes the Goal.” Interestingly, it was Kondañña alone who reckoned that Siddhattha was destined for Buddhahood. Four of the brahmins who had been present at the palace later told their sons to keep their eyes on Siddhattha, as he was destined for greatness. These sons grew up to become the other four of the Group of Five. These five ascetics had renounced worldly life and, at the time of this meeting, they had been practicing severe austerities for many years in order to further their spiritual path and realize the ultimate truth. Therefore, the Buddha began his teaching by addressing their current situation. He affirmed their belief that indulging in sense pleasures would not lead to true freedom. He then stated that their practices of severe austerity, denial of the sense pleasures, would also not lead to the truth. Thus, the Buddha begins the teaching by asserting the position of the Middle Way, of avoiding extremes of self-indulgence or self-denial. The Buddha asserted that neither of these paths would lead to ultimate truth. But in the case of the Group of Five, the Buddha was addressing “those who had gone forth.” They were samanas, “strivers”: they needed no recommendation that truth was worth seeking or that they had to apply themselves to it. They just needed to have the means clarified. So here the Buddha addresses them with some advice on the cultivation of right means as an expression and experience of enlightenment itself. And he begins with affirming the view that the ascetics would already have adopted—that chasing after and getting hooked on sense-pleasure is unworthy and useless. He starts where they already are—where every path should start. Then he balances that out by negating the ascetic view: saying that getting caught up with self-mortification was also useless. He thereby cuts away the ground and leaves them dangling in the middle, saying that it is in this “no position” that peace is to be found. After rejecting the two extremes of self-indulgence and self-denial, the Buddha then asserts that the "Middle Way" is to follow the Noble Eightfold Path — right view, right intention, right speech, right action, right livelihood, right effort, right mindfulness, and right concentration. The four noble truths are about “suffering,” how it arises, how it ceases, and a way to bring around that ceasing. These occupy the center of the Buddha’s teaching, because they already are central to human experience. Everyone knows the feeling of lack or loss or conflict in their lives: this is what the Buddha called dukkha, often translated as “suffering,” but covering a whole range of meanings and nuances. The Buddha asserted that dukkha, or suffering, can be transcended by following the Noble Eightfold Path. In this sutta, after presenting the Four Noble Truths, the Buddha then states: "My release is assured. This is the last birth. There is no further becoming.” Here the Buddha is asserting that he has realized selflessness or no-self (Pali: anatta) — the Buddhist view that what we call the "self" does not exist as a singular, independent, permanent entity, but is rather an ongoing process. Therefore, through complete understanding of the four noble truths, the Buddha has removed the causes and conditions for an ordinary rebirth (rebirth in samsara). This phrase can also be understood as an expression of pratītyasamutpāda. This sutta then states that while listening to the Buddha's teaching, the eldest of the five ascetics, Kondañña, has the following realization: “Whatever has the characteristic to arise, all that ceases.” This is an essential formulation of the Buddhist view of impermanence (Pali: anicca). The realization of impermanence is considered an important stage on the path to enlightenment. Ajahn Sucitto explains: "[I]n the Buddha’s discourses, this realization of impermanence represents the first major breakthrough of stream-entry." When the wheel of Dhamma had been set rolling by the Blessed One, the devas of the earth raised the cry: “At Vāranāsi, in the Deer Park at Isipatana, the incomparable wheel of Dhamma has been set rolling by the Blessed One—and it can’t be stopped by any samana or brahmin or deva or māra or brahma or anyone whomsoever in the world. In Ajahn Sucitto's commentary on this sutta, he describes the various realms where the Buddha's teachings were proclaimed. The sutras we have now in the Buddhist canon come from actual discourses of the Buddha that were memorized by the Buddha’s disciples and passed down in an oral lineage. Only centuries later were they written down, retaining much of the convention of the oral tradition. The repetition of phrases and even paragraphs was designed for easy memorization, and the whole style was developed to facilitate ritual recitation. As such sutras can be difficult reading, but their content, the actual words of the Buddha, are an infallible map out of the suffering that currently traps us. Of course we do not really know what the Buddha said in his first sermon ... and it has even been convincingly demonstrated[lower-alpha 1] that the language of the text as we have it is in the main a set of formulae, expressions which are by no means self-explanatory but refer to already established doctrines. Nevertheless, the compilers of the Canon put in the first sermon what they knew to be the very essence of the Buddha's Enlightenment. In Tibetan monasteries, as in most traditions within Mahayana Buddhism, the sutras (the discourses of the Buddha) and the shastras (the canonical commentaries) that are studied originate from the Sanskrit-language canon. In this case, however, we are using the sutra translated from the Pali language. [lower-alpha 2] Although it differs slightly in style and structure from the Sanskrit, the differences are minor, and in the West this is the better-known version. In the Pāli Canon, this sutta is contained in the Sutta Pitaka's Saṃyutta Nikāya, chapter 56, the Saccasamyutta "Connected Discourses on the Truths"), sutta 11. This sutta is thus also referred to as "SN 56:11". In the Pali Text Society's redaction of the Pāli Canon, this sutra is found in the Samyutta Nikaya's fifth volume's page 420; and an alternate referent for this text is "S v.420." A similar account can be found in the Pali Canon's Vinaya Pitaka's Mahākhandhaka. Ñanamoli Thera (trans.) (1993). Dhammacakkappavattana Sutta: Setting Rolling the Wheel of Truth. Piyadassi Thera (trans.) (1999). Dhammacakkappavattana Sutta: Setting in Motion the Wheel of Truth. Thanissaro Bhikkhu (trans.) (1993). Dhammacakkappavattana Sutta: Setting the Wheel of Dhamma in Motion. Thich Nhat Hahn (trans.) (1999). "Discourse on Turning the Wheel of the Dharma: Dhamma Cakka Pavattana Sutta". In The Heart of the Buddha's Teaching, p. 257. Ven. Dr. Rewata Dhamma (trans.) (1997). "The First Discourse of the Buddha: Turning the Wheel of Dhamma". In The First Discourse of the Buddha, Wisdom, pp. 17–20. Walpola Rahula (trans.) (2007). "Setting in Motion the Wheel of Truth". In What the Buddha Taught, Kindle Location 2055. The Tibetan ‘Missing Translator’s Colophon’ Version of the Dharma Wheel Discourse (chos kyi ‘khor lo’i mdo ‘gyur byang med pa): A New Translation into English by Erick Tsiknopoulos (2013) This is a translation of one of two versions of the Dharma Wheel Sutra in Tibetan, known as the 'Missing Translator's Colophon' version (Tib: 'gyur byang med pa). It is has a correlate in Chinese, translated into English by Lapiz Lazuli Texts and listed below. Lapis Lazuli Texts: Saṃyuktāgama 379. Turning the Dharma Wheel. This is a translation from the Chinese canon; the Chinese version is based on the Sarvastivadin Sanskrit version of the text (Dharmacakra Pravartana Sutra). Voice of the Buddha: The Beauty of Compassion (1983), translated by Gwendolyn Bays, Dharma Publishing (two-volume set). This translation has been made from French into English and then checked with the original in Tibetan and Sanskrit. Ven. Dr. Rewata Dhamma (1997), The First Discourse of the Buddha, Wisdom, ISBN 0-86171-104-1. Dhamma (Pāli) or dharma (Sanskrit) can mean a variety of things depending on its context;[lower-alpha 3] in this context, it refers to the Buddha's teachings or his "truth" that leads to one's liberation from suffering. Cakka (Pāli) or cakra (Sanskrit) can be translated as "wheel." 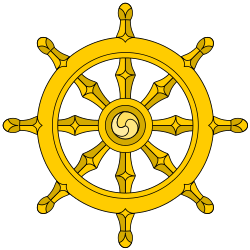 The dhammacakka, which can be translated as "Dhamma-Wheel," is a Buddhist symbol referring to Buddha's teaching of the path to enlightenment. Pavattana (Pāli) can be translated as "turning" or "rolling" or "setting in motion." "Turning the Wheel of Dhamma" (Dhamma, 1997). ↑ In Gombrich (2002, p. 61), Gombrich includes an end note here citing "Norman 1982" (see "#Sources" below). ↑ Geshe Tashi Tsering references the Pali version of this sutta (translated by Bhikkhu Bodhi) in his commentary on the four noble truths. ↑ For instance, in the context of the objects of mindfulness, dhamma refers to "mental objects" (see, Satipatthana Sutta). ↑ Ajahn Sucitto 2010, pp. 10-12. ↑ Dhamma 1997, pp. 22-24. ↑ Geshe Tashi Tsering 2005, Kindle Locations 163-169. ↑ Gethin 1998, p. 25. 1 2 Thich Nhat Hanh 1991, Kindle Locations 1822-1884. ↑ Thich Nhat Hanh 1999, pp. 6-8. 1 2 Ajahn Sucitto 2010, p. 18. 1 2 Ajahn Sucitto 2010, pp. 21-22. ↑ Ajahn Sucitto 2010, pp. 33-34. 1 2 Ajahn Sucitto 2010, p. 171. ↑ Ajahn Sucitto 2010, p. 184. 1 2 3 Ajahn Sucitto 2010, p. 193. 1 2 Ajahn Sucitto 2010, pp. 215-216. ↑ Ajahn Sucitto 2010, pp. 216-217. ↑ Geshe Tashi Tsering 2005, Kindle Locations 170-174. ↑ Gombrich 2002, p. 61. 1 2 Geshe Tashi Tsering 2005, Kindle Locations 242-245. ↑ Thich Nhat Hanh 1999, p. 257. ↑ Dhamma 1997, pp. 17-20. ↑ Walpola Rahula 2007, Kindle Location 2055. ↑ Thich Nhat Hanh 1991, Kindle Location 7566. ↑ Thich Nhat Hanh 2012, p. 81. 1 2 Geshe Tashi Tsering 2005, Kindle Location 174. ↑ Anandajoti (2010), "Introduction," retrieved 18 May 2010 from http://www.ancient-buddhist-texts.net/English-Texts/Earliest-Discourses/index.htm. Anandajoti Bhikkhu (trans.) (2010). The Earliest Recorded Discourses of the Buddha (from Lalitavistara, Mahākhandhaka & Mahāvastu). Kuala Lumpur: Sukhi Hotu. Also available on-line at http://www.ancient-buddhist-texts.net/English-Texts/Earliest-Discourses/index.htm. Gombrich, Richard (1988, repr. 2002). Theravada Buddhism: A Social History from Ancient Benares to Modern Colombo. London: Routledge. ISBN 0-415-07585-8. Norman, K.R. (1982). "The Four Noble Truths: a problem of Pali syntax" in L.A. Hercus et al. (ed. ), Indological and Buddhist Studies: Volume in Honour of Professor J.W. de Jong on his Sixtieth Birthday. Canberra, pp. 377–91. Saṃyutta Nikāya 56.11 Dhammacakkappavattana Sutta: Setting the Wheel of Dhamma in Motion translated from the Pali by Thanissaro Bhikkhu with links to alternative translations.